Being a music reviewer requires a good deal of organizational skill. No, really: you get all of these promos that come in and you need to keep them in some sort of order so that you actually listen to them all. I am a generally organized person, but i have a hard time mentally keeping MP3 files organized. I just cannot wrap my head around it, especially in the modern era when apps insist on showing non-file structure based displays of songs. What i mean is, if i stare at the folders i know where things are and know how to keep them organized. But the music app on my phone doesn't let me look at the folders. It shows albums and songs grouped by artist, and artists are listed alphabetically. It is a logistical nightmare for me, to be honest. And it means that, after i have the promos copied to my phone and i stare at the alphabetical listing in the music app, i never know which in that list are the newest promos that have come in. And because of this, sometimes a promo will linger on the phone for a while before coming to my attention. And there are probably promos that i have barely listened to that never get a fair chance as they are removed in order to clear space. Case in point: Kicking Every Day by All Dogs. I got this promo back in the summer of 2015, and i doubt i even listened to it before it got removed from the phone in order to clear space for the next round of promos. I upgraded my home computer to a Windows 10 device last year, and i spent some time playing with various music apps available for it. (Windows 10 is seriously under apped!) I finally found one that had a nice shuffle feature, but one of the intermediate apps i played with (and later rejected) would not shuffle no matter what i did, it would only play alphabetically. All Dogs, of course, are towards the top of an alphabetical list, and so this now deleted app introduced me to this record. I was working from home, and had the personal laptop "shuffling" (or not) and this record came on. I had to go look who it was and learn more. This is a very solid album of slightly melancholy pop punk that almost completely fell through the cracks in my reviewing process, but got saved by a random software flaw. Life is funny that way, but i am glad that i finally listened to this. So, it's a good record. Definitely worth hearing. 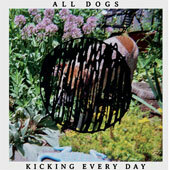 All Dogs are a four-piece act from Columbus, OH, based around singer/guitarist Maryn Jones, who you might know from such acts as quirky mountain folk band Saintseneca. Here she is making pop music, joined by guitarist Nick Harris, bassist Amanda Bartley, and drummer Jesse Withers. Kicking Every Day was their first full-length release, after a split with another band and a couple of singles. It appears that Ms. Jones has moved on to solo work, so All Dogs might be a defunct act as of this review. A shame, really. Kicking Every Day is a little over half an hour of music, spread out over ten tracks. The songs are noisy and catchy, but there is a hint of melancholy here, especially in the hushed vocal delivery that Jones uses. She sings slowly, lightly, often buried in the mix. Black Hole kicks things off with a slowly grinding rock tune. Jones and Bartley harmonize on the chorus, and the guitars chime nicely. It's a pretty start. Surprisingly, they slow it down even more for How Long. Guitars grind and Jones's singing is lethargic and melancholy, as if it takes all of her strength to ask "How long?" and she knows she doesn’t want to hear the answer. That said, the beat is great and inspires me to tap my toes along, slowly. Sunday Morning follows logically from this, a slowish song about a slow time of the week, but Jones sings happily about "waking up in the afternoon" over a beat that shuffles along nicely. Their single is next, the rocker That Kind of Girl. This reminds me a lot of the really great girl-fronted rock of the mid 1990s: Velocity Girl, Belly, Helium. It’s insanely catchy. It is back to the slower strumming on Your Mistakes, here joined by an organ. Another pretty song. However, Flowers is the first song that really shows their punk roots. This is a grinding fast tune with Harris channeling Superchunk's Jim Wilbur while Jones and Brantley harmonize. Great stuff. Leading Me Back To You is a mid-tempo rocker, Jones singing a little huskier as one guitar clatters while the other picks slow notes. Withers really pounds it here to great effect. On the chorus, Brantley and Jones harmonize in a way that reminds me of Lush ever so slightly. Ophelia bounces along happily, a nice poppy tune. Skin starts of slowly with jangling guitars, but builds to a bit of a roar on the chorus, Jones wailing away and the guitars grinding. Another pretty song. And finally they slow it down even more to end the record, with the acoustic The Garden. Jones and her guitar bring the record to a light close. There is a bit of sadness that peaks through the music here. But the music is very well done. And All Dogs can be catchy, even while performing a song that is not explicitly happy.